This collection of NPC-builds clocks in at 23 pages, 1 page front cover, 1 page editorial, 1 page SRD, leaving us with exactly 20 pages of content, so what do we get? Well, the answer here is pretty straightforward – we get 20 alchemist-builds, one for each level. All right, that was an old and pretty lame joke the first time around; now, it’s ridiculous. Sorry. 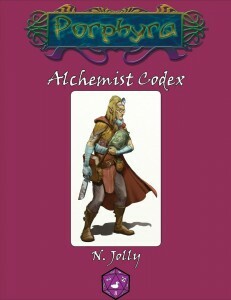 So, much like the previous codex detailing sample kineticists, this one instead tackles alchemists and aims to give the GM sample builds to throw at characters, while also providing an interesting background story for them. Additionally, the reader can glean at a cursory look that thankfully, the helpful boon-entries for befriending the characters are still part of the deal. Now, the previous codex excelled in the diverse selection of unique races and archetypes it employed – and the kineticist is a young class that doesn’t yet have this much fodder for diversification. Well, the alchemist does not suffer from this restriction and hence, we get a solid array of options – mindchemists, psychonauts, chirurgeons, grenadiers, preservationsts, clone masters, reanimators and beastmorphs all get their due with a fitting character – oh and obviously, the level 20 vicisectionist is FEARSOME. Damn, this creature is BRUTAL: Hunter Dark, psychotic lizardfolk killer…who may just be willing to help you…provided he may eat the dead. So yes, archetype-wise, we have a rather rich diversity here. Similarly, there are plenty of unusual races represented here: Living ghouls, for one. And yes, muses, saurians, gnolls…quite an array. It should be noted that this time around, there are no psionic races utilized, though one of the Porphyran xelusine drow is used. Now the last codex had, as mentioned in that review, less diversity in the feat-department – well, guess what? This book does A LOT better regarding build-diversity – granted, in part due to the simple fact that the alchemist is a more versatile class regarding the ways you can take it: From bombing-specialists to more melee-centric builds that rely on extracts and mutagens, the build (and feat) diversity is significantly higher here and leaves nothing to be desired – kudos! Editing and formatting are pretty good, though there are some typos and similar glitches in the book – “bolster” instead of “bolstered” and the like. Rules-wise, there are a few very minor hiccups here, but overall, the statblocks are solid and ready to be used. Layout adheres to Purple Duck Games’ two-column full-color standard and the pdf has no artwork apart from the cover, but comes fully bookmarked for your convenience. Brian Jolly’s collection of alchemist builds is diverse, intriguing and sports some truly unique characters. While the at times a bit rushed editing takes this down a slight notch, this still can be considered an inexpensive, nice collection of alchemist statblocks. My final verdict will hence clock in at 4.5 stars, rounded down to 4 for the purpose of this platform. You can get these diverse alchemist-builds here on OBS and here on d20pfsrd.com’s shop!